Behutsame und starke Klavierklänge, die unter die Haut gehen: Du bist eingeladen zu Deiner ganz persönlichen Reise, begleitet von Klavier-Improvisationen, Tee und Kerzenlicht. Ob im Tanzen, Zeichnen, oder einfach nur stillem Dasitzen - lass uns miteinander Qualitätszeit genießen. Ivan Sobolew ist ein in Berlin lebender Pianist, Komponist, Performer und Kulturwissenschaftler. Gentle and powerful piano sounds which get under your skin: You are invited to a very personal journey accompanied by piano improvisations, tea and candle light. Be it dancing, writing, relaxation or just inner silence - let us share some quality time… It is your quality time. 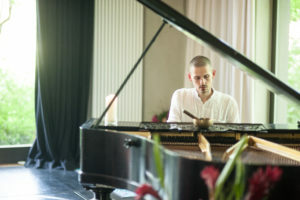 Ivan Sobolew is a pianist, composer and performer from Berlin. and who has the knowledge of the sound knows the secret of the universe. My music is my thoughts and my thoughts are my feelings. the more beautiful are the pearls that I carry within me as tone and melody.